Riviera: The Promised Land (Yakusoku No Chi Riviera) is a role-playing game developed by Sting, originally released for the WonderSwan Color in 2002 and then completely remade for the Game Boy Advance in 2004. As the first version was Japan-exclusive and on an unpopular system, it would be the second version to become the most known and loved one, eventually earning the reputation of an underrated classic. Riviera was also made available for the PlayStation Portable in 2006, as an enhanced remake of the Game Boy Advance version - featuring more and larger artwork, and full voice acting. It is the first episode of the Dept. Heaven series, a collection of games taking place in the same universe and sharing the same timeline. Riviera plays like a mix between a visual novel and a RPG. Although battles have a tactical, turn-based gameplay, characters cannot be directly controlled in the exploration phase; instead, each screen has some triggers which can be activated to start events and move. The number and variety of actions that can be performed in each screen and the way each choice branches through the game makes it so that each playthrough will be different from the next. The game also features different endings depending on which party member was favored during your adventure. Riviera's turn-based gameplay is also unique in which all characters can use all weapons and items, but each one will use them in a different way. For example, one character might be able to use a spellbook to cast healing magic, another to cast attacking magic, and another yet won't be able to draw any magic from the spellbook, but will still be able to throw it at the enemy. Riviera is very focused on its story and characters, with some of the most solid writing I've found in any game. Its universe features a blend of several mythologies, with the Norse component being the most prominent. Asgard, the realm of the gods. Utgard, home of demons. Long ago, a war between gods and demons--Ragnarok--erupted...and the world was thrown into a state of chaos. Asgard, overrun by demons, was on the brink of destruction. In desperation, the gods broke an ancient taboo. Sacrificing their very lives...they created black-winged reapers that came to be known as Grim Angels. Each wielding a godly weapon known as a "Diviner," the angels entered battle. Through their fierce resistance, the angels brought the war to an end. Signs of the demons' return have brought fear to this peaceful land. Without the gods, Asgard cannot withstand another war. And so, The 7 Magi, proxies of the gods, made a decision...They will actuate the Retribution unleashing the power within Riviera. 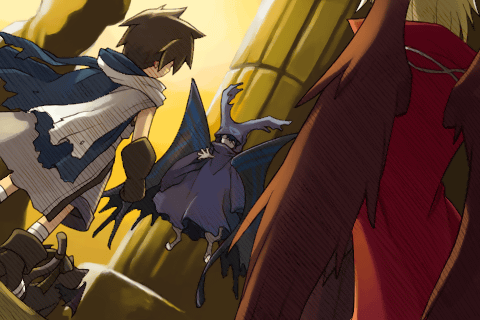 The game tells the story of the wingless Grim Angel Ein, sent to the island of Riviera by Hector, one of the seven magi. Ein is tasked with the mission to unleash its divine power by destroying it (thereby actuating the so-called Retribution). When he reaches Riviera, he finds out that it's inhabited by a peaceful folk known as the Sprites; he is brought to know them and becomes one of them. Instead of destroying Riviera, he decides to fight the demons that are putting the existence of the island at risk. Together with his friends Fia, Lina, Serene and Cierra (plus his cat-like familiar Rose), Ein will fight to protect the land. Ein (Ecthel in the Japanese version) is the main character of the game. He is a young Grim Angel who traded his wings for his sword, Einherjar. Earnest and kind, Ein is concerned with the fate of Riviera in spite of having been sent there by Hector to destroy it. Ledah is the other Grim Angel who was sent to Riviera with Ein. He does not speak much, but seems to have traded something very important for the fire Diviner Lorelei. He is extremely powerful. Fia lives in Elendia, on the isle of Riviera. She is caring and gentle, but also serious and resolute. While she fits the role of the healer, Fia is also deadly with the holy rapier, her choice weapon. Lina (Lyuri in the Japanese version) is Fia's sister. In spite of her childish attitude, she is actually the older one. She is a trained archer, and her arrows are like lightning. She seems to have a fascination with bats. 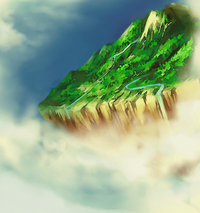 Serene belongs to the people of the Arcs, and lived on Rosalina Island prior to the appearance of the demons. She is quite a tomboy, and her strong constitution enables her to use her giant icy scythe without breaking a sweat. Cierra is the "older sister" of the group. As a witch, she knows much about potions, and specializes in channeling fire spells with her staff. Although competent, she can be very absent-minded, and is prone to getting lost. Rose is Ein's familiar. She came with him and Ledah to Riviera. She is very intelligent, and often acts as Ein's voice of reason. Cierra insists in calling her Gateau. Hector is one of the Seven Magi, the proxies of the gods. He is the one who ordered Ein and Ledah to go to Riviera to actuate the Retribution. Ursula is the goddess who protects Riviera and its inhabitants, the Sprites. She opposes the Retribution. Sensing kindness in Ein, she gives him temporary amnesia and brings him to live with the Sprites so he could learn who they really are.